Once a cheater, always a cheater? In the marriages of Krystal Tin (田蕊妮) and Chapman To (杜汶澤) or Wen Zhang (文章) and Ma Yili (馬伊琍), the women chose to forgive their husbands’ cheating and work out their problems to find happiness. 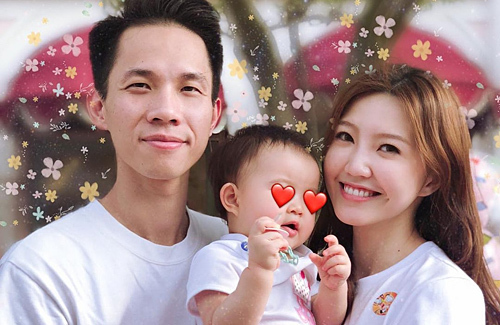 Hong Kong singer, Jinny Ng (吳若希), also recently revealed that her husband Alex Ho (何兆鴻), was once unfaithful to her, but she chose forgiveness instead. During the early stages of their relationship, Alex was seeing another woman while dating Jinny. The couple had dated for only several months at the time, and they ultimately broke up. However, Jinny found out she was unexpectedly pregnant, which led to the couple giving their relationship another chance. When their daughter turned six months, Jinny officially became Mrs. Ho. Despite making the decision to marry Alex despite his cheating, resentment still festered in Jinny. She constantly threw tantrums and made unreasonable requests to push Alex’s buttons. Alex remained patient and tended to her every need. Slowly, Jinny grew to trust Alex more and finally let go of the bitterness. When a partner cheats in a relationship, is it happier to walk or stay in the relationship? If the couple still loves one another, learning from the mistake may strength the relationship. Time, mutual effort, and understanding will help a couple overcome these obstacles. if the tables were turned, would these cheating husbands be so forgiving of their wife who does the same? @msxie0714 he must have plenty of dough for her to forgive him. women are always on the losing end. they forgive their partners when they cheat so as not to break up the family. however if the women fell in love with someone, their spouses are not that forgiving. well what can one say… shes only there for the money!!! @jimmyszeto this fella was dating another woman while with this woman. he doesn’t have the looks…why else would any woman like him?